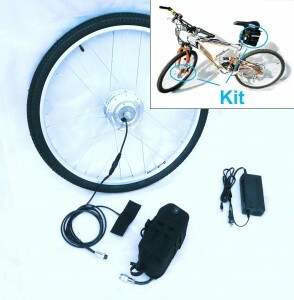 The Hill Topper has to be the easiest to install electric bike conversion kit on the market, featuring a front wheel with in-hub motor, lithium battery with controller, and simple throttle switch. The controller is all encased within the battery banks and there are only a few plugs and Velcro straps to connect everything together. This has to be one of the best thought out electric bike conversion kits on the market, down to every last detail. Manufactured in the US this kit has all been developed with the highest quality componentry possible. This unit has enough torque to help heavier people get up hills. The simple plug and go system makes this bike conversion kit the easiest to install in the market. When I first read about the on off switch for the throttle I thought this would be horrible. But after reading about them further and talking to owners of the lithium hill topper, I realized the throttle switch is quite a good idea as most people either ride with full or no throttle. So why add a throttle which is time consuming to install, may not fit on all bikes and is more prone to problems. Instead a simple switch that can be positioned almost anywhere on the bike is a great solution. Battery Mount: Quick attachment seat pole mount. A company called LEED sells an electric bike kit that is comparable to the hill topper. I bought a battery from them for my hill topper kit. I found their battery to be much better and sturdier. I did my research before buying since my neighbor has a couple of their kits on his bike and his wife’s bike. They love their kits and use them almost every day. From what I have seen online in reviews, with my neighbor, and from my personal experience with both company’s batteries I would recommend LEED over hill topper.